Most of the world now recognizes that it is highly unlikely that Roy Brown administered the fatal shot to the Red Baron. What is not readily recognized is what became of Roy Brown afterwards. The following pic of a snippet from the Toronto Star weekend edition(2018-04-21), gives insight into some of this. Last edited by ArisFuser; 04/21/18 05:04 PM. Tnx Aris, I was having some issues on my end getting it to post. Wow, great article! Is there any direct link to it so I can read it online? Some parts were hard to make out and I would like to see the whole article. Interesting tidbit that Brown originally learned to fly from the Wright brothers themselves! The article also does a good job in pointing out how the Baron's earlier head injury likely played a role in his death. No one knew 100 years ago the long-lasting effects head trauma can have on judgment and decision making. 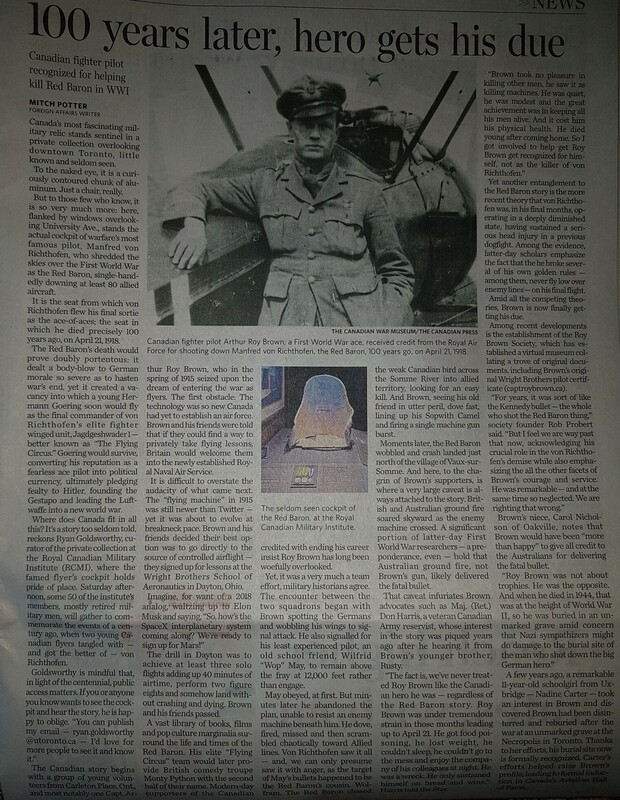 That newspaper is rife with error, at least regarding Richthofen as being "in a diminished state" in the last months of his life, and "breaking his own golden rule." My research has proved all that is horse hockey. It's wrong. He was absolutely recovered from his head wound nine months after receiving it. Last edited by JFM; 04/23/18 08:58 AM. Being an expert on MNR, what is your take on why the Baron acted as he did on his last mission. Do you have an incite into his mind set and whether his head injury affected his personality with respect to his dicta? This question seems to be the latest issue at hand based on the latest studies of brain injuries but of course I suspect we can never know for sure if this affected MvR's performance. I have seen comments that reflect his mood changes after the accident but of course it is here say. Hi! It's real easy: MvR acted the way he did because he had *always* acted that way. He did *nothing* different on 21 April 1918 than he had done at any other time in his career, including *before* his head wound. The problem is these "changes" and "violations" that we've all read about are erroneous conclusions based on outright error. I have a 20,000+ word chapter on this subject alone in my MvR book--I dare say it is more thorough, encompassing, and larger than anything else ever written on the subject, even it it was all combined and then quadrupled. It's a bit much to put it all in here (buy the book! MvR Vol 2) but I'll gladly discuss/debate/answer questions. MvR did not have PTSD; did not have constant headaches; did not have constant nausea; did not exhibit unusual personality changes; did not "hide within his four walls" after his head wound until KIA; did not "violate" his personal combat dicta in any way; did nothing on 21 April that he had not done over a dozen times before, that we know of. Remember, I used to believe he DID have all those things and DID "violate" his combat dicta. But after years of research focused on this very subject, I had to follow the facts. What do you want to talk about first? Let me know what I can help with/correct. Thanks for your response and willingness to clarify. Yes I don't have your books, and yes if I did I might not be asking you these questions. Your point is well taken. During your intensive research, I guess for me, the one thing that would help significantly is knowing if those who were close to him, ever commented in written or officially recorded orally if they had noted any persistent changes after the head injury that would intimate he was not functioning at full potential. 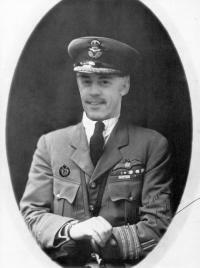 Jim, with your interest and expertise on Richtofen, the movie, "The Red Baron," must have driven you nuts. There's not a shred of truth in it and I don't know why they even bothered. You had to laugh at the part where Roy Brown and MVR become freinds. And then he helped Von R's "girlfreind" cross over the lines so she could be at his funeral!! Haven't read your stuff,yet. So far my favorite book about the Baron has been Floyd Gibbon's. "The Red Knight of Germany." It was written in the 1920's though, if I remember correctly, so it doesn't have any of the new information on him, of course. "From our orbital vantage point, we observe an earth without borders, full of peace, beauty and magnificence, and we pray that humanity as a whole can imagine a borderless world as we see it, and strive to live as one in peace." First, Robert, I was NOT chiding you or anyone else for not having or reading my books--PLEASE don't think that! I'm sorry if I gave that impression. I would never do that. I was just promoting the book to whomever reads this thread. "...the one thing that would help significantly is knowing if those who were close to him, ever commented in written or officially recorded orally if they had noted any persistent changes after the head injury that would intimate he was not functioning at full potential..."
Actually, the opposite is true. Every anecdote indicates he was jovial, accessible, normal at the end of his life. The "nausea" so often cited actually only occurred after his first flight post-wounding back in August 1917, and just that one time, at least as has been recorded. There are no other records of any sort of in-flight nausea. Nor did he experience nausea from the wound and fly anyway, as is claimed; the nausea was because of the flight, the result of it. Yet, this one event has been turned into "he experienced nausea and flew anyway, and did so until he was killed." Simply not true and a gross exaggeration of the result of one flight. Similarly, there is only one further anecdote about headache after his release from the hospital, which came from his mother. It's the known story how when on leave at home, MvR had a headache and took a nap from which he was awakened to greet well-wishers, and he appeared surly when he came down from the bedroom. Somehow this has turned into he "always" had headaches until he died. Not true, at least as has been recorded. And there are anecdotes indicating that MvR would be irritated be awakened from any nap, not just that one! So the irritation from being awakened from a nap was normal, and the headache might have been the result of his wounding--the headache in question happened in September 1917, after all--or he might have just had a headache. Who knows? But either way, there are NO records or anecdotes of chronic headaches for the rest of his life. None. "[Manfred] was hungry. He at a large piece of the groat-torte. I seated myself next to him. 'How does it taste to you?' 'Superb!' Suddenly our eyes met, and we laughed in unison, like two playful children." "[Manfred] looked healthier and fresher compared to when he was on leave in the fall... Certainly--he had never complained, but for a time it [being wounded] had crippled all his strength. He had looked altered; very wretched and sensitive, as I saw him again at that time [three months previous]. That was now past." "THAT WAS NOW PAST." The mention of one headache in September 1917 becomes a chronic condition until MvR is killed seven months later, but three months before his death his mother says in essence he looks better and his strength has returned, and this is ignored? Pooch, I didn't watch that film and have never seen it--it would have led me to start drinking again! Just the trailers of the Albatroses in power dives while in a formation tighter than the Blue Angels was all I needed to see to stay away. Thanks Jim for the clarification. I think it is beneficial to many of us who are not so close to the heart of the matter. I knew you would be the man to set things straight. Not to worry about my comments, they were equally tongue in cheek although missing an appropriate imoji! Having both of Jim’s books on the Baron I can highly recommend them for anyone who is interested in Richthofen. They are a treasure trove of information. I heartily endorse JFM's stance. Differentiate FACTS and extrapolation therefrom. Notwithtanding that JFM is a clear authority on MVR, it's pure conjecture to ascribe a mental state to any individual at the time of their death without evidence, anecdotal or otherwise to support the inference... and inference is as factual as you can get if you weren't in the cockpit.. Yon same OP article offers opinion on Brown's mental and physical health too, which I don't dispute as I've not studied the man, but I would need to see the evidence to support it. It's human nature, I guess, to want to believe that there has to be some extraneous reason for the death of a venerated warrior, but none of them were supermen and certainly not immortal. MVR wasn't Achilles, as much as I like Russell Smith's classical metaphor. Richthofen, like every other pilot in WW1, faced death every single time he took up a machine. Eventually, whether he was jovial or grim, war-weary or upbeat doesn't matter.... She got him. That said, and slightly OT. I'm more aware of evidence of war-weariness and combat stress (in some form or other) in Allied pilots and see less in accounts (first hand or otherwise) of their CP adversaries. Can someone correct me on this, or is it a fair observation? Oh that I was back in the dear old PBI. With no more Triplanes on me tail, nor tracer tracing by. And only a couple of feet to fall whenever I want to die. ... Richthofen, like every other pilot in WW1, faced death every single time he took up a machine. Eventually, whether he was jovial or grim, war-weary or upbeat doesn't matter.... She got him. It certainly is interesting to hear from a real expert on the subject. The wonders of "selective editing" huh? Something we should all be very wary of. These quotations from Mrs von R should be very telling to any reader since, if anyone was going to be able to detect if MvR was suffering from some concealed condition resulting from his previous wounds, then certainly his own mother would be foremost among them. He certainly would have suffered from battle fatigue which has a way of weaving eccentricities into a person's normal disposition, I'd hazard a guess that most stories pertaining to any such eccentricities are more likely the result of this than his injury and that they didn't particularly impair his flying ability considering the fact that his commanders and subordinates found him to be fit for service for quite some time afterwards. It's a shame you missed the movie JFM, apart from absurdly implausible flying and a plot so weak that it would make a fanfiction writer on reddit blush, you missed some really hilarious scenes of overacted hysterical shouting matches between MvR and Lothar. "...you missed some really hilarious scenes of overacted hysterical shouting matches between MvR and Lothar." Yes, interesting how they decided to switch the two men's characters around. In the movie, Lothat is the serious, no nonsense Prussian, chiding his brother on the way he's behaving, and Manfred is the hard drinking ladies man. In actuality, The Baron was known to be rather shy around women, while Lothar was the party guy. As a matter of fact, he was killed some years after the war while flying with a well known German actress. One of the biggest "sources" that has led to the belief MvR was a shell of a man at the time of his KIA is his writing Thoughts in a Dugout. This undated document, first published in 1933, was inserted in Peter Kilduff's excellent biography Beyond the Legend of the Red Baron late in MvR's life, under the subheading of "A LAST REFLECTION." As Peter wrote, the piece "expresses a sombre mood not evident in earlier writings." Indeed it does. And in the context of its April 1918 placement within the biography, certainly would bolster an image of depression, etc., late in life. Except, remember, the document is undated! NObody had any idea when it was written. Peter put it in his biography right before detailing MvR's death, and suggested it "reads as if it were MvR's final comment on his life and career." The salient words are "as if." But, again, the writing is undated. NObody knows exactly when it was written. But being included so late in the biography, its authorship has come to be regarded as "dated" by said placement. I.e, April 1918. However, based on literally ALL anecdotal evidence, the writing does not match with MvR's actions and personality at the end of his life AT ALL. At all. I went through the document line-by-line and compared it with MvR's life, actions and accomplishments, as well as Germany's strategic and tactical situations, in March/April 1918--none of those things match the conditions in the document. None. But if you compare the document to late summer 1917--i.e., right after he was released from the hospital and began flying combat missions again, before his forced recuperative leave--the conditions in the document accurately reflect Germany's strategic situation, and MvR's personal situation. As I summarized in my Vol 2 book, "Until the discovery of the original dated [Thoughts in a Dugout] manuscript, the 26 August through mid-September 1917 time frame of Thoughts in a Dugout's composition [which I had just presented with examples]--with a strong leaning toward 26 August through 3 September as being the most likely window of authorship--remains conjectural, but it is without question a much more viable possibility than is March or April 1918." "Hard-drinking ladies man? duh "
Yes, the movie would have had you throwing things at the screen. At one point, MVR, is trying to convince the Kaiser (I remember it being the Kaiser, although it could have been a high ranking general) that Germany was losing the war and should sue for piece. The old, "There's been enough killing!" speech. Can you imagine a proud Prussian officer like him, from a military family actually saying that to a high ranking official or officer? The movie was just rediculous.